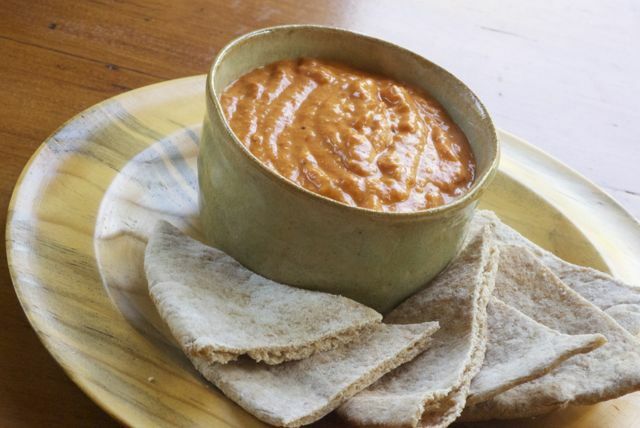 This versatile spread is perfect on toast points or crackers for a party appetizer, but it also would make a good sandwich filling or dip for pita triangles and veggie sticks. You can roast the red peppers yourself, but by using store-bought, you can assemble the dish in less than five minutes. In a food processor or blender, place cashews, bell peppers, lemon juice, salt, and yeast. Blend until smooth, approximately 1 minute.